Buy ManatiHerz a Coffee. ko-fi.com/manateelove - Ko-fi ❤️ Where creators get paid by fans, with a 'Buy Me a Coffee' button. 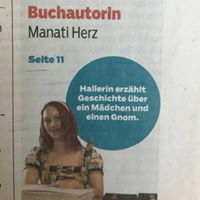 Manati Herz ist Autorin, wandernde Poetin, Verlegerin und Käsesommelière, für all das muss man ganz schön fit sein und da man kaum noch Zeit zum schlafen hat, hilft ein Kaffee wirklich sehr. Secured Payments. Support goes to ManatiHerz's account. Upgrade ManatiHerz to a yearly Gold Membership with a one-time payment.